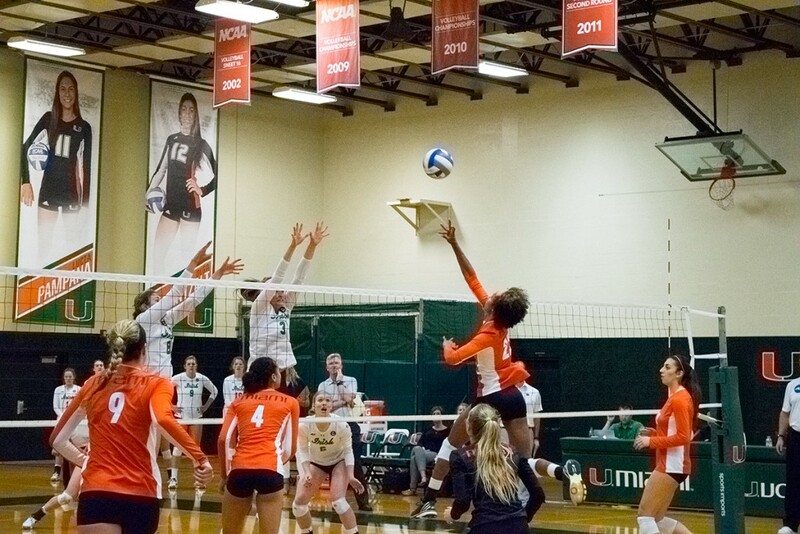 The Hurricanes defeated ACC foe Notre Dame 3-1 at the Knight Sports Complex on Sunday. It was a much-needed win going into the final stretch of the season, especially after Miami (18-8, 11-4) lost at home for the first time this season Friday night to Louisville. “Friday was such a close game that we talked a lot about finding a couple points and minimizing some errors,” Head Coach Jose Gandara said. Sophomore setter Haley Templeton did well distributing the ball, tallying 51 assists for the match. Her efforts allowed three hitters to tally more than 10 kills each. Senior outside hitter Alexis Mourning finished with 13 kills while outside hitters redshirt junior Kelsie Groot and sophomore Olga Strantzali both recorded 14. The Canes beat the Irish 25-16 in the first set after taking a 5-0 lead thanks to Strantzali’s serving and kills from Mourning. The Irish offense never got going due to poor passing and hitting errors. However, Notre Dame rebounded in the second game, winning 25-21. The teams traded points throughout games three and four, and Miami suffered from unforced errors as well as a few questionable calls from the referees. Despite this, the Canes came back and won both games 25-18, 25-18. The Canes, now 11-1 at home, have four more regular season games before the NCAA Tournament starts on Dec. 3. The team next plays Duke at 7 p.m. on Friday in the Knight Sports Complex.